Will the Galaxy S5 make its mark on business? The hands-on is out and the comparison (with the S4) is in. The Galaxy S5 is now firmly on our radar as consumers but what does it offer for businesses and enterprises globally? Well, unfortunately not a lot we have to admit. Samsung has been playing it safe with the S5, opting for a safe upgrade path, and an understandable stance after what has appeared to be a cycle of major hardware upgrades happening over the first four generations. 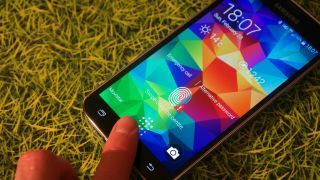 The only major business-focused hardware improvement is a new biometric feature, a finger scanner that can be used for m-payment authentication. Samsung has signed an agreement with Paypal and it is likely that this might encourage other mobile manufacturers to follow suit. What is of interest to us though is that Samsung already announced its commitment to sort out its software. More than half of the employees assigned to its R&D division work on software and that is likely to rise. And now that hardware is sorted (and kind of downplayed), it does make sense for Samsung to up its game and provide potential business users with market-leading applications. Short of a full-on BlackBerry acquisition, Samsung is gradually building the momentum around its KNOX entreprise service offering. There have been a number of announcements involving the Global Enterprise Mobility Alliance (GEMA) as well as Citrix and ZScaler. The big one though is happening tonight as none other than Samsung Electronics' President and CEO, JK Shin, will host a dinner and press conference to talk about how Samsung's products and solutions can help "businesses enhance their processes, empower workforce and lead your company forward in a rapidly changing environment." I wouldn't bet against this event including news about KNOX and the Samsung Galaxy S5.